^ The term "small" refers here to the linearized limit, in practice the values of these momenta may not be small at all. 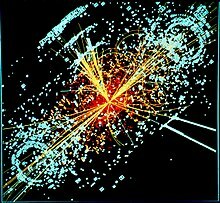 ^ a b If one expands the Higgs potential then the coefficient at the quadratic term appears to be negative. This coefficient has a physical meaning of squared mass of a scalar particle. ^ a b Dirac, P. A. M. (24 November 1951). "Is there an Æther?". Letters to Nature. Nature. 168 (4282): 906–907. Bibcode:1951Natur.168..906D. doi:10.1038/168906a0. Retrieved 16 October 2012. ^ a b Dirac, P. A. M. (26 April 1952). "Is there an Æther?". Nature. 169 (4304): 702. Bibcode:1952Natur.169..702D. doi:10.1038/169702b0. ^ K. P. Sinha, C. Sivaram, E. C. G. Sudarshan, Found. Phys. 6, 65 (1976). ^ K. P. Sinha, C. Sivaram, E. C. G. Sudarshan, Found. Phys. 6, 717 (1976). ^ K. P. Sinha and E. C. G. Sudarshan, Found. Phys. 8, 823 (1978). ^ a b G. E. Volovik, The Universe in a helium droplet, Int. Ser. Monogr. Phys. 117 (2003) 1-507. ^ N. N. Bogoliubov, Izv. Acad. Nauk USSR 11, 77 (1947). ^ V. L. Ginzburg, L. D. Landau, Zh. Eksp. Teor. Fiz. 20, 1064 (1950). ^ A. D. Sakharov, Sov. Phys. Dokl. 12, 1040 (1968). This paper was reprinted in Gen. Rel. Grav. 32, 365 (2000) and commented in: M. Visser, Mod. Phys. Lett. A 17, 977 (2002). ^ a b c d e K. G. Zloshchastiev, Spontaneous symmetry breaking and mass generation as built-in phenomena in logarithmic nonlinear quantum theory, Acta Phys. Polon. B 42 (2011) 261-292 ArXiv:0912.4139. ^ M. Novello, M. Visser, G. Volovik, Artificial Black Holes, World Scientific, River Edge, USA, 2002, p391. ^ G.E. Volovik, Int. J. Mod. Phys. D15, 1987 (2006) ArXiv: gr-qc/0604062. ^ L.D. Landau and E.M. Lifshitz, The Classical Theory of Fields, (1951), Pergamon Press, chapter 11.96. ^ V. A. Bednyakov, N. D. Giokaris and A. V. Bednyakov, Phys. Part. Nucl. 39 (2008) 13-36 ArXiv:hep-ph/0703280. ^ B. Schrempp and M. Wimmer, Prog. Part. Nucl. Phys. 37 (1996) 1-90 ArXiv:hep-ph/9606386. ^ a b c A. V. Avdeenkov and K. G. Zloshchastiev, Quantum Bose liquids with logarithmic nonlinearity: Self-sustainability and emergence of spatial extent, J. Phys. B: At. Mol. Opt. Phys. 44 (2011) 195303. ArXiv:1108.0847. ^ S. R. Coleman and E. J. Weinberg, Phys. Rev. D7, 1888 (1973). ^ a b c V. Dzhunushaliev and K.G. Zloshchastiev (2013). "Singularity-free model of electric charge in physical vacuum: Non-zero spatial extent and mass generation". Cent. Eur. J. Phys. 11 (3): 325–335. arXiv:1204.6380. Bibcode:2013CEJPh..11..325D. doi:10.2478/s11534-012-0159-z. ^ K. G. Zloshchastiev, Logarithmic nonlinearity in theories of quantum gravity: Origin of time and observational consequences, Grav. Cosmol. 16 (2010) 288-297 ArXiv:0906.4282. ^ K. G. Zloshchastiev, Vacuum Cherenkov effect in logarithmic nonlinear quantum theory, Phys. Lett. A 375 (2011) 2305–2308 ArXiv:1003.0657. This page was last edited on 15 March 2019, at 18:56 (UTC).